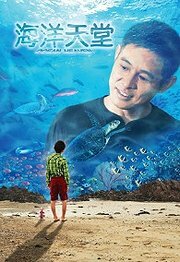 Ocean Heaven (海洋天堂 Hǎiyáng Tiāntáng) is a 2010 Chinese-Hong Kong drama film starring martial arts superstar Jet Li in his first full drama role. It also co-stars Taiwanese actress Kwai Lun-mei. Jet Li wants this film to get a good message across and promote the works with autism as well as the works of his charity ‘The One Foundation’. Jet Li plays a single father with terminal cancer who prepares to face death, and struggles to ensure that his autistic son will be well cared for after he is gone in this emotionally-charged family drama. David was only seven when his mother died. Now, at 22, he still doesn't seem to register that she is never coming home. His father Sam (Li) works at an aquarium. With the help of their benevolent neighbors, David has managed to give his son a good life. But now Sam is dying, and soon David will be all alone. As his condition rapidly deteriorates, Sam attempts to provide David with the tools and lessons he will need to function independently in society. "I hope everyone can examine what is the most important relationship in life – the relationship between parent and child", he said. "I met some autistic children last year when I was doing charity work. When I read the script, I cried. I hope to express gratitude to all the parents in the world through the film." Jet Li did not take any pay for the film. He hoped the movie will encourage people pay more attention and dedicate their compassion to charity. TIME magazine named Jet Li one of its Most Influential People this year for his work with his One Foundation. Li revealed that four or five years ago, his nephew had been diagnosed with autism. His nephew is now better, but this incident made him realize how important it is to offer attention and care to those who are have been diagnosed and their families.